In March 2016, Aéroports de Paris welcomed 7.5 million passengers; an increase of 1.4% on March 2015. 5.1 million passengers travelled through Paris-Charles de Gaulle (+0.8%) and 2.4 million through Paris-Orly (+2.8%). International traffic (excluding Europe) was up by 0.9%, with a growth in the following destinations: the Middle East (+6.2%), French Overseas Territories (+5.7%), Latin America (+2.8%), Africa (+2.0%), North America (+2.0%). Only Asia-Pacific was down (-9.4%) mainly due to a decrease in the Japan and Malaysia destinations. The number of connecting passengers decreased by 0.3%. The connecting rate stood at 26.0%, down by 0.5 points compared to March 2015. 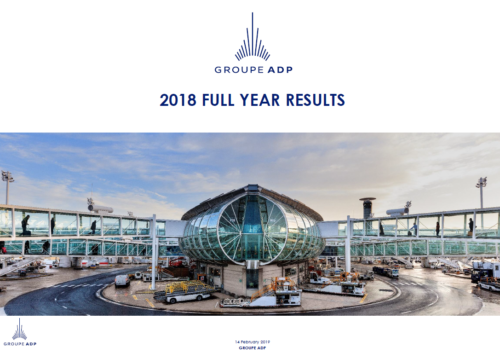 Since the beginning of the year, Aéroports de Paris passenger traffic has seen growth of 1.9%, with a total of 20.9 million passengers. The number of connecting passengers has risen by 3.7%. The connecting rate stands at 26.6%, up by 0.5 point. Passenger traffic at TAV Airports, 38%-owned by Aéroports de Paris, increased by 6.3% in March 2016 and has risen by 6.1%(1) since the beginning of the year. (1) TAV Airports started to operate the international terminal of Milas Bodrum Airport in October 2015. To be compliant with TAV Airports' presentations, the % change presented above does not take into account Milas Bodrum international terminal for 2015. Taking into account international terminal Milas Bodrum traffic on a like-for-like basis for 2015, total TAV Airports passenger traffic would have risen by 6.2%, by 6.1% since the beginning of the year and by 6.7% over the last 12 months. (1) TAV Airports gère le terminal international de Milas Bodrum depuis octobre 2015. Pour être conforme aux présentations de TAV Airports, la variation présentée ci-dessus ne prend pas en compte les mouvements d'avion de ce terminal en 2015. En prenant en compte pro forma les mouvements d'avions du terminal de Milas Bodrum en 2015, le nombre de mouvements d'avions total de TAV Airports serait en en hausse de 5,2 % sur le mois de mars de 6,9 % depuis le début de l'année et de 5,6 % sur le cumul des douze derniers mois.